Followers of this blog may recognize this image. As the Winterthur catalog description states, it also appeared on a wedding plate by John Sadler in 1769. Copies of this plate are in the collections of both Winterthur and the National Maritime Museum. The image is exactly the same in every way, meaning that the transfer was re-used from tile to plate. It causes me to wonder if the image appears on any other item. Perhaps a pitcher or bowl? Though nothing new can be said about the sailors depicted, Winterthur offers something new: a companion piece! It turns out that the transfer in the fist image, and therefore on the wedding plate, is a follow up to this one! They are the cliche "sailor's farewell" and "sailor's return." 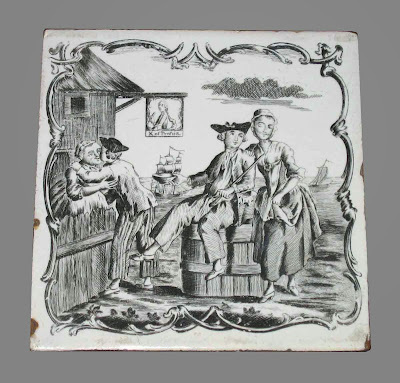 The sailor's return is depicted on the second tile. The central figure, gesturing away to the ship, appears to be the same tarpawlin who so happily leans into the arms of his woman. His cocked hat points forward over short hair with side curls. A single breasted and loosely fit short jacket with open slash cuffs hangs open over a shirt with no waistcoat. At his neck is a white neckcloth tied not unlike a cravat, but loose. A pair of slops completes his garb. 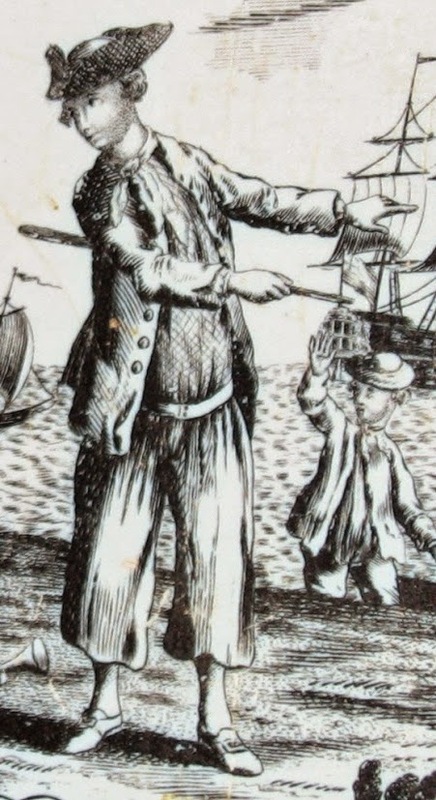 The stick we see in the "sailor's return" tile is present here, tucked under his arm. In the background are some of his shipmates climbing aboard a jolly boat. The largest figure stands on the left, and is dressed in virtually the same fashion as the central figure, but with a round hat rather than a cocked hat, and no stick. In the boat is another jack who wears a cocked hat with the brim hanging down, no jacket, and shirt sleeves rolled up to just below his elbows.